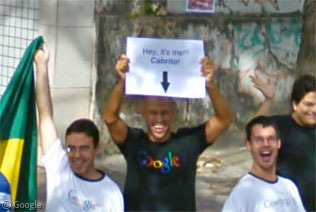 officially welcoming Street View to Brazil. We’ve recently heard rumors that, as with so many of Google’s products, one of the engineers has a hidden message…. Perhaps it’s this man, who’s called Cabrito (or so his sign says). We presume he works for Google, but can’t find him on LinkedIn. Is there a hidden message in the sign? 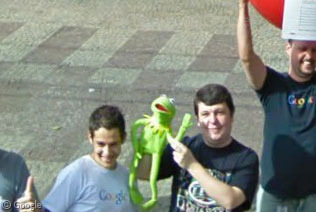 This is Kermit the Frog, we’re pretty sure he doesn’t work for Google. Why is he there? Is it another secret message? 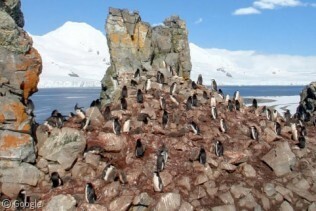 Or is it these two guys, standing away from the main group? 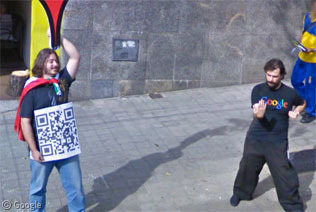 The image held by the man on the left is a QR code, a 2D barcode format that was originally made popular in Japan for printed weblinks, and is now used on Google’s Favourite Places program. It must contain a secret message! You can get apps for most mobile phones that will read the QR code and automatically direct you to the link contained. Sadly, due to the uneven paper on our Googler’s sign, we are unable to read the QR code from the street view image. My phone’s camera can’t pick up your QR code next to the title of this post…must be because it’s gray scale or the text is over it. That first guy has a google profile. Can you guess the url? “Cabrito” is not that guy’s name! It’s funny to see you think so! Ah, good point Rob. 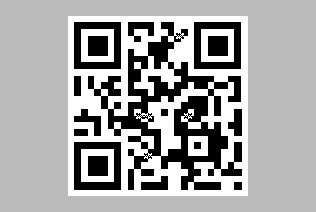 Luckily QR codes have error correction to deal with at least 7% errors, so my missing pixels don’t affect the message.